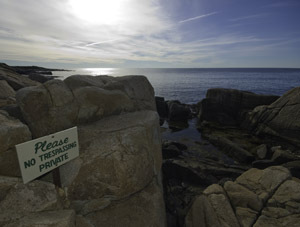 According to Maine law, Private landowners can and often do hold private property rights to the low water mark. These private property rights are subject to a public easment for fishing, fowling, and navigation up to the mean high tide line. Maine law does not guarantee access to the intertidal zone, so it’s still neccessary to find an access point that will allow you to get below the high water mark, but as long as you’re below the high water mark Maine law guarantees the right to engage in “fishing, fowling, and navigation” there.